Regardless of what your plans are this Valentine’s Day — dinner with your man at Maxime’s in Paris or drinks with the girls at your favorite martini bar — the right color to wear is obviously red. It makes your complexion glow, and gives you an excuse to wears your favorite red lipstick. 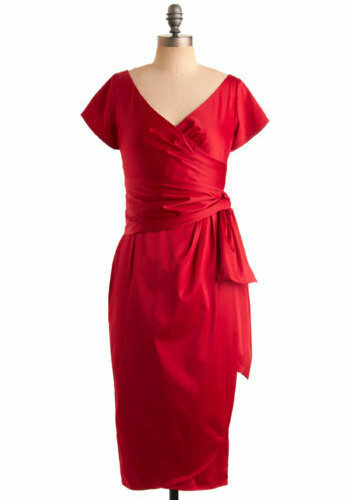 And while the holiday may be a few weeks away, why wait to find the perfect red frock for the occasion? This dress is so elegant and graceful, you’re in danger of stealing more hearts than just the one you’re after this Valentine’s Day. It’s a demure below-the-knee cut, with a flattering criss-cross top and gathered detail at one side. Pair with sleek patent peep-toe pumps and a clutch with a vintage rhinestone necklace and earrings. 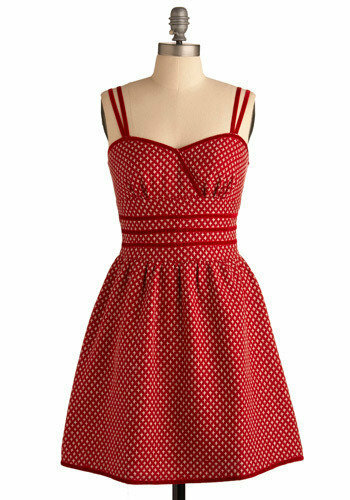 Woo him, wow him, this Valentine’s Day in this gorgeous 1940’s vintage-inspired dress! 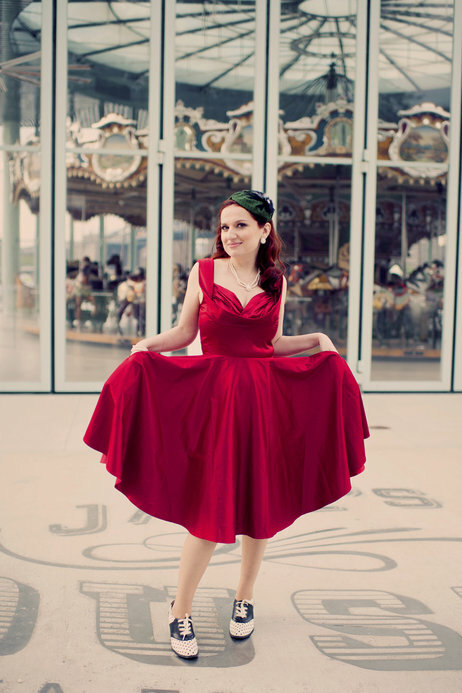 It’s made of a deep red wool-blend fabric, with a delicate X pattern woven throughout, a wide waistband with red velvet details, and a flattering full skirt. Pair with a cropped cardi and gold necklace to complete the look. Remember that scene in “The Seven-Year Itch” with Marilyn Monroe in that amazing white halter dress, standing over the subway grate? 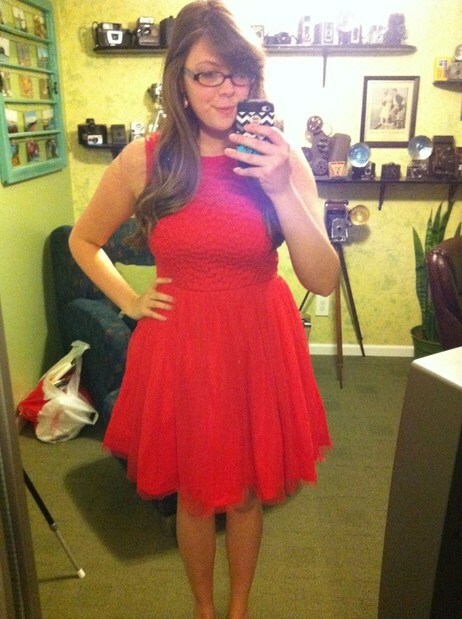 What’s red and ruffled and hot all over? This shapely strapless dress, that’s what! 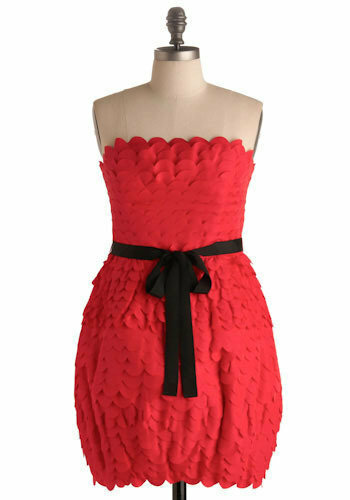 Have you ever seen anything like this feathery ruffling detail? And I love the little black belt, which makes this dress smashing with black tights and tall black heels. This dress is ideal for a more casual Valentine’s Day dinner, maybe at the Italian restaurant where you had your first date. All you need is a pretty necklace and a cardigan and your favorite wedges, and you’re set! I love the tiny pleats along the back-tie belt, and the pleats adoring the cap sleeves! If you’re blessed with a long, graceful neck, pin your hair up and wear this beautiful boat-neck dress this Valentine’s Day. All that’s missing is your favorite pair of heels, a soft wrap, and a necklace made of tiny pearls. 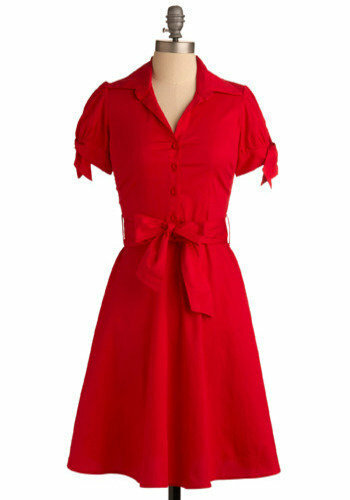 A modern take on the classic shirt-dress, done in bright red, with bow details on the cap sleeves and with the tie belt. It’s flattering, with a full skirt, and would look oh-so-pretty with a pair of Mary Janes or ankle booties this Valentine’s Day! 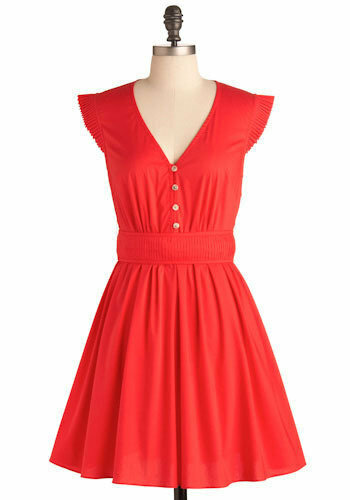 Flirty, funky, and fun, this LRD (Little Red Dress) is ideal for a night on the town, any day of the week! Add black heels and a soft shrug and you’re set! 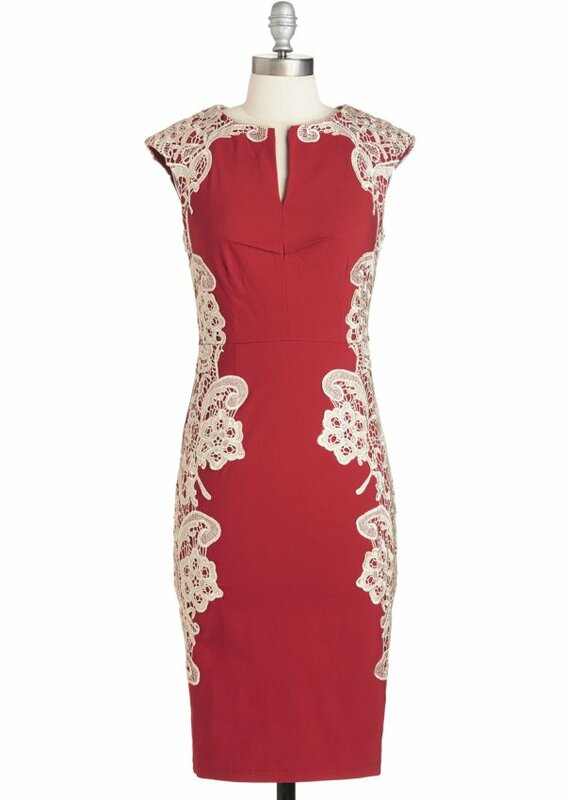 Accentuate your feminine curves in this red sheath dress. The lace details along the sides accentuate your best assets, and the colors looks gorgeous on any complexion. Looking for something that’s less sweet, and more spicy? This is your dress! The tantalizing cutouts and full skirt leave just enough to the imagination. The black lace and delicate ruffles add just a touch of sweetness to what’s otherwise another red-hot dress! No matter what the fancy-dress occasion, the designers at New Orleans-based Trashy Diva label have your glam gown covered. 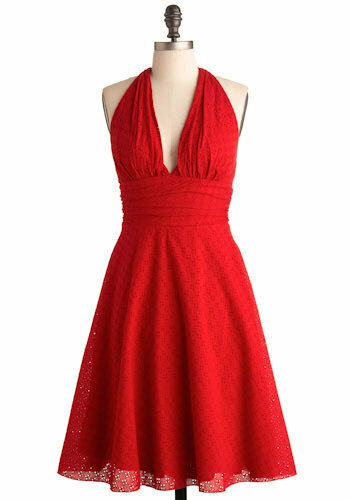 This dress is a rich red color, made to flatter every figure. Gorgeous red hue, to match your favorite lippie? Check. Darling delicate rosette detail? Check-eroo. 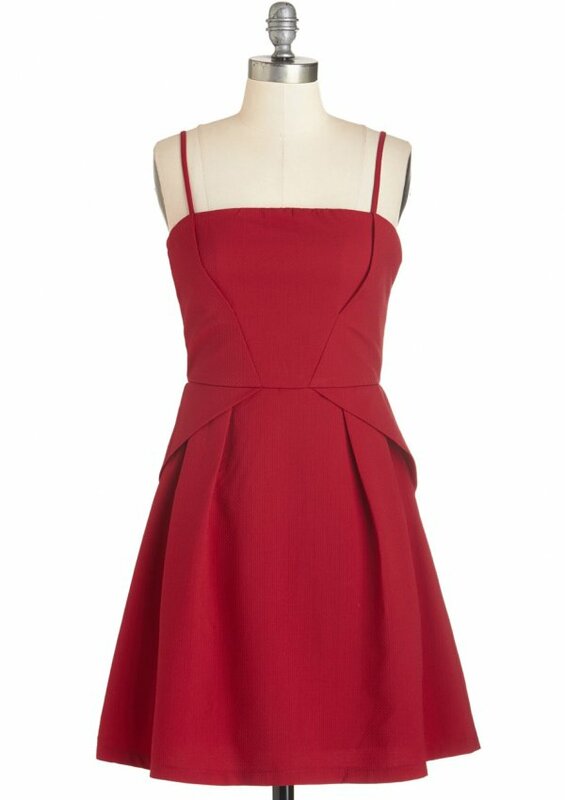 Well, that was easy – here’s the red dress you’ve been waiting for! 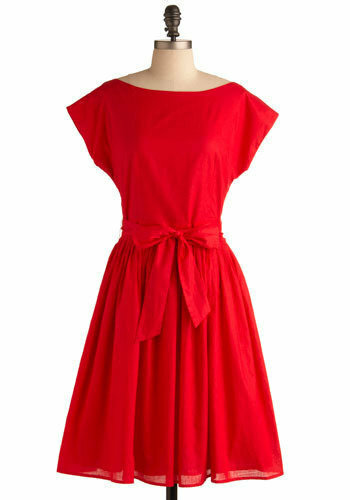 With so many gorgeous red dresses in so many styles, how will you ever choose just one? I love that first one with the tiny white X pattern, and the shirt dress is darling, too! Which of these glamorous dresses do you like best, and how would you wear it this Valentine’s Day?